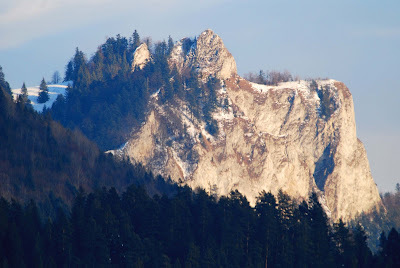 To the east of the high Tatra mountains are the Pieniny. (Pennines - Apenines - Pieniny - some common root word?) Driving back from Czorsztyn on Tuesday, we spotted this view, which merited a pop with the 80-400mm Nikkor. This is the peak of Trzy Korony (Three Crowns), one of the highest peaks on the Polish side of this range. And yes, there are people on the top. Some stunning views from the top on Google Earth, though not for vertigo sufferers. 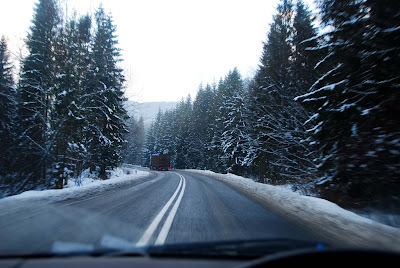 The road back took us through some wintery wonderland, pine trees in snow, light frost, empty road. Zigzag, Oregon?